LYMPHEDEMA is a chronic swelling of specific areas of the body due to damage to the lymph system. Lymph fluid, a protein rich fluid collects in the tissues when the lymph system is compromised. Protein in the tissues attract additional water and swelling results. Primary Lymphedema which occurs as a result of a genetic mishap while the fetus is in utero. This will usually present at birth or early childhood, but in some cases in adulthood. Secondary Lymphedema occurs as the result of damage to the lymphatic vessels usually traumatic injury, surgery involving lymph nodes, radiation therapy post-cancer, or the cancer itself. It is believed that thirty percent of all breast cancer survivors who undergo lymph node resection and radiation therapy will develop lymphedema. THE PURPOSE of the lymph system is to filter out waste products in the body. Lymph fluid is predominantly protein, water and large molecular fats, and other waste products, including bacteria and viruses. It is the body’s sewage system. Left untreated, the build up of stagnated lymph fluid in the tissues is not only painful, it leads to localized and systemic infections including cellulitis. There is no cure for lymphedema at this time. It is considered a life-long condition. Treatment of the condition and education for patient self-care are essential to lymphedema management. Manual Lymph Drainage, a light touch massage which clears the lymph paths and stimulates the movement of trapped lymph fluid. Compression Bandaging with condition-specific bandages and foam inserts to force excess water back into the blood stream and soften fibrotic tissues. Therapeutic Exercises geared to the individual patient’s abilities to promote lymph drainage and optimize range of motion and increase physical strength. Custom Pressure Garments to be worn daily for support. Applying appropriate pressure to maintain the reduction of lymph fluid in the affected area. Patient Compliance includes a comfortable and functional pressure garment. 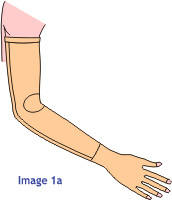 Sleeve to Axilla with a silicone-lined band at the top, posterior expansion panel of soft high-stretch fabric, and an anterior elbow insert of the same stretch fabric. The sleeve is overlapped by a custom glove with open or closed finger tips which omits the tight and restrictive band at the wrist. Numerous custom configurations are not only feasible, but recommended depending upon the diagnosis and therapy regime. Bio Concepts has worked closely with lymphedema specialists to develop a protocol for lymphedema garment design that meet the individual needs of your patients. Gloves may be made without wrist bands and may also be designed to complement the sleeve instead of compounding the pressure. Options such as elbow and finger inserts, expansion panels and Silon-TEX lined proximal bands ensure a custom fit. With five different materials and 30 different colors we have more to offer your patients. Bio Concepts specializes in custom service and custom care. Tell us how you want it and we’ll do what we can to make it happen. We have developed a protocol for lymphedema garments. Let us help you give your patients the custom support they deserve.